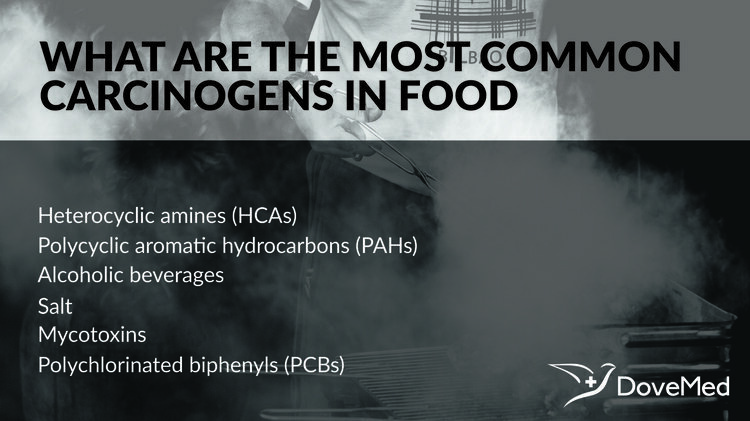 What Are The Most Common Carcinogens In Food? According to the Occupational Safety & Health Administration, “carcinogens are agents that can cause cancer.” These agents could be chemical substances, infectious agents, or even radiations. According to the Occupational Safety & Health Administration, “carcinogens are agents that can cause cancer.” These agents could be chemical substances, infectious agents, or even radiations. Food contaminants that are carcinogenic to humans or could potentially be carcinogenic are termed nutrition and dietary carcinogens, or simply food carcinogens. The International Agency for Research on Cancer (IARC) and National Toxicology Program (NTP) have separate lists of known human carcinogens that include food contaminants/agents that cause cancer. Primarily, there are four food contaminant types that may be potentially carcinogenic. Overcooking foods that are rich in protein, such as fish and meat (beef and pork), or cooking (or grilling) them to high temperatures may give rise to HCAs that are thought to be linked to stomach cancer. However, a clear and direct causative link between HCA and cancer is yet to be established, even though HCAs are known to be mutagenic. Red meat cooked at high temperatures (or smoking of meat) can give rise to PAHs, a known environmental toxin that may cause cancer of the digestive tract. They may also enter the human body through consumption of contaminated food and water. PAHs are known to have the ability to alter cell DNA. All kinds of alcoholic drinks can cause cancer, chiefly oral, gastrointestinal tract, and liver cancer. However, this is dependent upon the period/duration of consumption and dosage. Excessive drinking of alcohol puts one at risk for liver damage and liver cirrhosis that could result in hepatocellular carcinoma. Studies have established that a regular consumption of high salt foods (such as foods preserved or pickled using salts) may increase the risk for gastric, nose, and throat cancer. These salts may be in the form of nitrates, nitrites, and chlorides. High dietary salt erodes the stomach linings exposing them to viral infections such as from Helicobacter pylori, a known carcinogenic agent in humans (per IARC). Mycotoxins are toxins produced by certain fungi, such as Aspergillus flavus, that give rise to a group of toxins known as aflatoxins (a known carcinogen as per both IARC and NTP). This fungus can contaminate food like peanuts, nuts, and grains (maize and corn), which can affect animals consuming them. Humans eating meat or products of such contaminated animals may also be infected. PCBs are a group of synthetic organic compounds used for industrial purposes and have since been banned by the US government. Fish that are farm-raised may contain above acceptable levels of PCBs, which is a known carcinogen. International Agency for Research on Cancer (IARC). Agents Classified by the IARC Monographs, Volumes 1 – 110. 2014. Accessed at http://monographs.iarc.fr/ENG/Classification/ClassificationsGroupOrder.pdf on October 1, 2014. Wang, X. Q., Terry, P. D., & Yan, H. (2009). Review of salt consumption and stomach cancer risk: epidemiological and biological evidence. World journal of gastroenterology: WJG, 15(18), 2204. Sachse, C., Smith, G., Wilkie, M. J., Barrett, J. H., Waxman, R., Sullivan, F., ... & Colorectal Cancer Study Group. (2002). A pharmacogenetic study to investigate the role of dietary carcinogens in the etiology of colorectal cancer. Carcinogenesis, 23(11), 1839-1850. Sugimura, T. (2000). Nutrition and dietary carcinogens. Carcinogenesis, 21(3), 387-395. Claeys, W. L., De Vleeschouwer, K., & Hendrickx, M. E. (2005). Quantifying the formation of carcinogens during food processing: acrylamide. Trends in Food Science & Technology, 16(5), 181-193. O’Brien, J., Renwick, A. G., Constable, A., Dybing, E., Müller, D. J. G., Schlatter, J., ... & Wolfreys, A. (2006). Approaches to the risk assessment of genotoxic carcinogens in food: a critical appraisal. Food and Chemical Toxicology, 44(10), 1613-1635. Jiang, G. O. N. G. (2009). A Brief Introduction on Carcinogens in Food. Animal Husbandry and Feed Science, 1, 080.